Body lengths of 10', 12' and 14' are available, with height options of 6' and 7'. 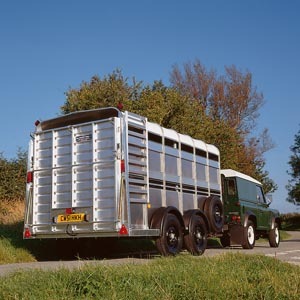 The 7' versions, with optional centre partition fitted, allow two 16.2hh horses to be transported*. All trailers have a maximum gross weight of 3500kg; payload varies between 2010kg and 2550kg depending on size and specification. All sizes are available with either the standard ramp, combination ramp doors or with the EasyLoad™ ramp and folding deck system. TA510 trailers are fitted with a twin axle beam (tri-axle option on 14' model), leaf sprung suspension, galvanized steel chassis, aluminium side panels, heat reflecting roof, and grip-faced aluminium planking covered rear ramp. These trailers also feature aluminium ramp gates, pressure treated timber planking with slip resistant aluminium treadplate flooring, receiver brackets for the optional cross divisions, side ventilation flaps and front access door.